Chileans Acero Letal (translating as Lethal Steel) are determined to prove the point that metal coming out of their country does not have to be only of black or death variety. Not working fast in terms of releases, they have honed their skills (and revamped their lineup) to now present a 2-track 7” EP through German label Witches Brew. Completely committed to the spirit of the 80s metal, Acero Letal throw caution to the wind, and at the risk to be labeled old-fashioned (something perhaps they actually desire), they play fast fist-pumping heavy metal, the likes of which labels like Cruz del Sur, Shadow Kingdom, Pure Steel and sometimes Ektro fight over. The opener Veloz Invencible focuses on just dizzying unabashed speed, JAG’s fingers flying up and down the fretboard save for a quick mid-song breather. Duro Metal is less about being a solo loving guitar hero, and is more polished, harmonized, with even further emphasis on Latin American melody. 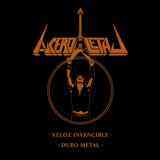 Yes, Duro Metal also features some keyboards, which provides somewhat of a modern touch, but also shows that Acero Letal would not be averse to experimenting with progressive tendencies here and there. With a grand total of whopping 4 tracks in their entire discography (if I am counting correctly) it is difficult to say if Acero Letal is destined for grand things, but this particular EP was sure enjoyable on a quick morning ride.